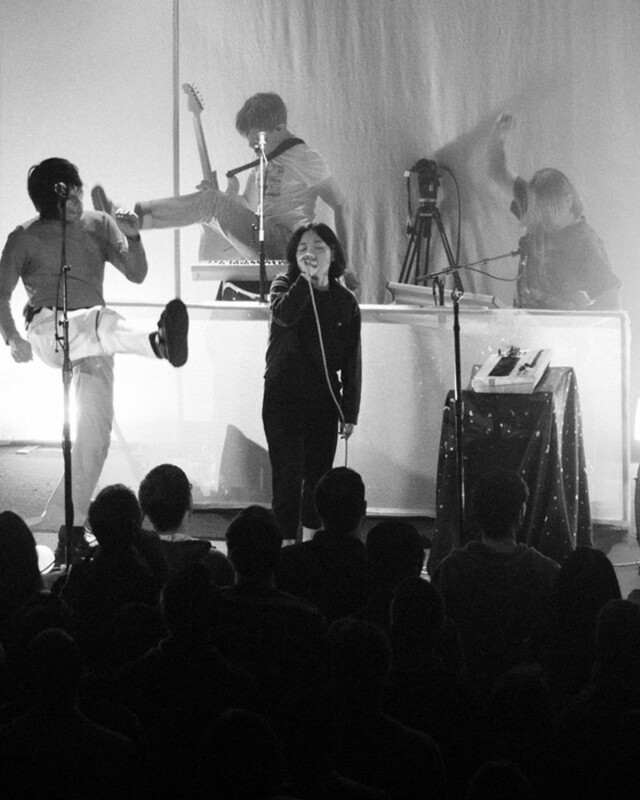 Watch Superorganism Perform “Something For Your M.I.N.D.”. As the lights went down and the projectors went up, blasting a pitch-shifted message from found footage of a bandmate roaming in the woods à la Blair Witch Project, members of Superorganism marched on stage in red raincoats looking somewhere between fashionable retro-chic trendsetters and members of a brightly colored cult. Ringing triangles, holding up glowing miniature models of the moon, and painted by projected digital noise, the backup singers’ entrance is jarring to the senses but creates a palpable excitement for what’s to come from the confusion. Watch Superorganism Perform “Everybody Wants To Be Famous”. Then the diminutive lead vocalist Orono Noguchi joined them in what had to be the most comfortable outfit in the venue (sweatshirt, sweatpants, and slides). With a near emotionless gaze as she prepared to perform, her whole aesthetic could only be described as “terminally chill.” But as the self titled song of their self titled album began, she instantly mesmerized the crowd with an intangible magnetism that kept the audience charmed and dancing the rest of the night. Superorganism’s songs translate to a live setting amazingly well. The grooves feel funkier, the lyrics seem more frolicsome, the drums knock harder, and the sing alongs become sing songier. They combine the animated whimsy of The Presidents of the United States of America with the concise songwriting of Pavement. Their stage show is thoroughly entertaining. It included a 5 minute Q&A interlude with Orono, synchronized dance moves throughout, and having as many people from the audience that could possibly fit on stage joining them for the finale. Watch Superorganism Perform “Prawn Song”. Full Performance Below. The band’s sense of irony and wit shine throughout and Orono intermittently joked about them being a “damn indie hype band.” It’s a fair assessment. They came out the gate hot. Every major music publication deemed them the next big thing and even a “DIY version of a big budget hit factory.” It’s easy to write off something that seems cooked up in a meme based indie-pop science lab, but seeing is believing. They turned me from skeptic to super[organism]fan over night.